The on-field matchup between the Seattle Seahawks and Pittsburgh Steelers is, by our early estimation, too close to call. The Steelers have superior talent; the Seahawks have a superior coach. It should be a doozy of a Super Bowl. In matters of tradition and football pedigree, however, the Black 'n' Gold beats the Green and . . . uh, Green in a gruesome mismatch. Consider: The Steelers have four Lombardi Trophies and an all-time roster loaded with famous names: Bradshaw, Swann, Stallworth, Blount, Lambert, Von Oelhoffen. Legendary Seahawks? Let's see, there's Steve Largent, one of the three or four finest receivers of all time, and absolutely the greatest among those who require SPF 4000 sunscreen at the beach. And there's . . . well, that's just about it. Largent. A list of one. Otherwise, the Seahawks' status through the years has been as a football footnote. Like Michael Jackson (the moonwalkin' freakshow, not this guy), they haven't done a damn worthwhile thing in about 20 years. Their last playoff victory before this season came in 1984, when they beat the Los Angeles Raiders in an AFC wild card game. No, they weren't habitually awful like the Cardinals, or comically inept like the pre-Peyton Colts. They were just sort of there, a nondescript tribute to mediocrity. Heck, they could have folded, and the news may not have spread past Tacoma. You almost wonder if certain players' legacies have suffered by association to the franchise. Sure, there was only one Largent, but I can think of two Seahawks who were stalwarts in their day but have been all but forgotten except by the most ardent NFL Films junkies. I give you Curt Warner. 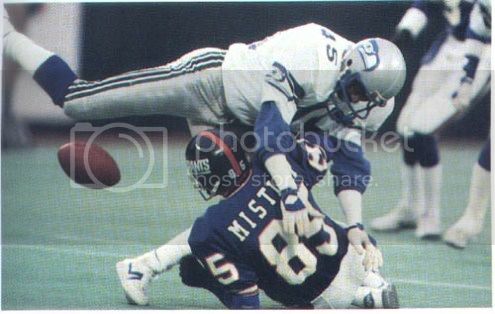 I give you Kenny Easley. Do their names ring a bell? I imagine they do, even though I suspect you haven't heard them in years. Warner was the greatest running back in franchise history until Shaun Alexander scribbled his name all over the record books. 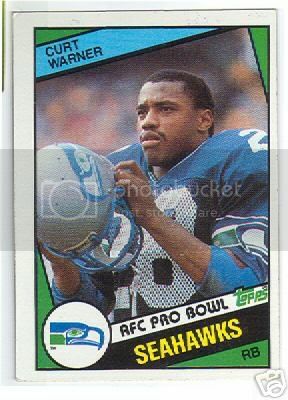 A smooth, deceptive slasher whom you'd swear was the prototype for Curtis Martin, Warner amassed 6,705 rushing yards in a Seattle career that began as a first-round pick out of Penn State in '83 - and ended six years and one severe knee injury later. After running for an AFC-best 1,449 yards as a rookie, Warner destroyed his knee while catching his cleat on a seam in the dangerous Kingdome turf 10 carries into the opener in his sophomore season. His career was thought to be in jeopardy, but he came back in '85 and recaptured his old form in '86 with 1,481 yards and 13 TDs. But while the numbers were impressive, the knee was never the same, and it became a chronic problem over time. The Seahawks let him go at the end of the '89 season, and he played out the string in an uneventful seven-game stint with the Rams in '90. His career was over at age 29. While Warner's tale is sad, Easley's teetered toward tragic for a time. 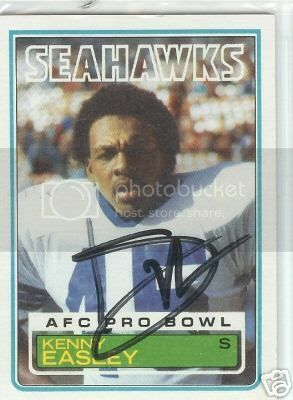 The Seahawks' first-round pick out of UCLA in '81, he quickly established himself as the hardest-hitting safeties in the league - think Rodney Harrison with a cornerback's speed. He was AFC defensive rookie of the year in '81, and NFL Defensive Player of the Year in '84. How respected - or maybe the better word is feared - was Easley during his prime? Ronnie Lott, someone who knows a thing or two about quality safety play, insists to this day that he was never Easley's equal on the football field. The sentiment was not unique. Lott, of course, is in the Hall of Fame, and for a time it seemed Easley would travel a similar path to football immortality. He made five Pro Bowls in his seven ('81-'87) seasons in Seattle, and it was reasonable to believe his storybook career would conclude with a celebration in Canton. But the final chapter came sooner than anyone planned. Easley's career ended abruptly in '88 when it was revealed he needed a kidney transplant. Like Warner, he was finished at 29. Then it got messy. Easley sued the Seahawks, contending his kidney problems were the result of doctors encouraging excessive use of ibuprofin to treat an earlier injury. It was only in 2001 that the player regarded as the most talented Seahawk of all reconciled with the franchise and took his rightful place in the team's Ring of Honor. During these, far and away the Seahawks' headiest days, here's hoping someone shakes the cobwebs off the history books and permits these forgotten and overlooked heroes share in the spotlight during the Super Bowl festivities. Curt Warner and Kenny Easley had their time cut short. Why not treat them to a little bit more glory now? NEWS ITEM: The Celtics trade G/F Ricky Davis, C Mark Blount, G Marcus Banks, F Justin Reed and a pair of second-round picks to the Timberwolves for F Wally Szczerbiak, C Michael Olowokandi, F/C Dwayne Jones and a conditional No. 1 pick. WHAT WE LIKE ABOUT THE TRADE: Szczerbiak can shoot the hell out of the ball (20.1 ppg, 49 percent from the field) and if he can control his selfish tendencies could be a swell complement to Paul Pierce. But we're going to go with the even more obvious benefit here. Celtics boss Danny Ainge corrected the biggest mistake of his regime - the decision to give Blount a six-year, $40-million contract after his curiously well-timed decent half-season 2003-'04 season. We watch a fair amount of the NBA - certainly more than, say, Isiah Thomas - and we feel comfortable stating that Blount is the second-biggest mutt in the league. He simply just does not care. He got the big money, and he mentally retired, simple as that. And he's not nearly gifted enough to get away with pulling such a despicable stunt. He has a decent jump shot for a man his size, but any reasonably coordinated 7-footer should be able to average more than the measly 4.2 rebounds Blount stumbles into during his 28 minutes of playing time per game. His idea of defense is to kindly step aside, and he has hands as soft as trash can covers. And did we mention that he doesn't give a flying bleep at a rolling expletive? We did? Well, he doesn't. If we actually found humor or irony in the sluggish approach he takes to his job, we might have gotten a chuckle out of his announcement that his last name is pronounced "Blunt." That's exactly the kind of object every self-respecting Celtics fan has daydreamed of pummeling him with at one time or another. Now he's the T-Wolves' headache, and the minutes he shouldn't have been getting in the first place will go to young Al Jefferson and Kendrick Perkins. Good riddance, jerk. 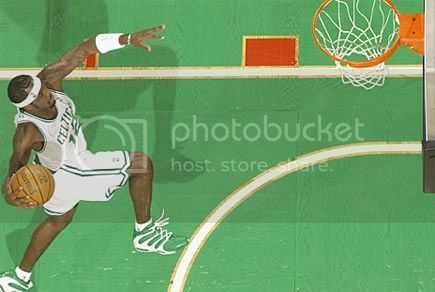 WHAT WE DON'T LIKE ABOUT THE TRADE: Seeing Ricky Davis go. Yeah, yeah, we know he has his weird quirks and flaws - he takes frequent naps on defense, his shot selection sometimes leaves you wondering if he might have a concussion, and he contributes more to the stat sheet (19.7 ppg) than he does to a winning cause. But man . . . at his best, he is just plain fun to watch. He might be the most electrifying athlete ever to wear the green and white (excepting Greg Kite, obviously), and yet he features a vintage midrange shooting game, a lost art in the current NBA and a hint at how hard he works to hone his fundamental skills. Plus, he plays the game with a smile, an endearing habit that earns him plenty of Tommy Points from us. Aw, lay off Ricky, man. He just wants to ball, yo. Considering how we'd been ominously warned about what a selfish gunner and divisive force he was when he arrived from Cleveland in Dec. '04 for the rickety remains of Eric Williams and Tony Battie, I'd say his time in Boston went a long way toward repairing that reputation. He was a good citizen (no Celtic is better with kids), made the games entertaining (and isn't that why we watch? ), and was just a little nuts in a harmless, almost charming, way. I'll damn sure miss him. And regarding what the Celtics got in return . . . well, it's interesting we should mention the word selfish. We've rooted for Szczerbiak, a genuine top-notch offensive talent and a better pure athlete than you think, since he carried mid-major Miami (Ohio) to the Sweet 16 back in '99. But we've followed Wally World from afar; I'm not sure he's a guy you want playing on your favorite team. He has a reputation as a ball chaser, demanding his own shots at the expense of the offensive flow. He also has a history of bickering with Kevin Garnett, and considering KG is one of the few superstars who brings his intensity and passion to the floor every single night, that's a definite red flag. Garnett is about winning, first and foremost, which makes you wonder what exactly Szczerbiak is about. The educated guess here is that it also begins with W. But at least he can - and will - play. Remember how we ranted a few sentences ago about Blount being the second-biggest dog in the league? Well, get ready to meet Fido No. 1. Olowokandi is the Pervis Ellison of this generation, always "injured." always looking oh-so-ridiculously cool sitting down at the end of the bench in his natty suits, always staring at the JumboTron when the coach is talking, always looking like he's mentally counting his cash and, on the off-chance that he has any shame, thanking the heavens he grew to seven feet tall. He is a dog, D-O-G, and if he ever gets on the court for the Celtics - I think he's sidelined with a career-threatening case of hat head at the moment - his off-the-charts cluelessness, indifference, stone hands, and ever-so-brief teases of actual ability will have you remembering Blount as the second coming of Robert Parish. So tell me . . . how in the hell was this stiff drafted first overall, 9 picks ahead of Paul Pierce, in the '98 draft? Huh? How? Oh, right. The Clippers. LAST SHOT: Judging by the angry mass of words we just spewed, you'd think we hated this trade like Shaq hates Kobe. Fair to conclude, but not entirely accurate. We've calmed down now. We've taken a deep breath (not to mention a couple of big swigs from our favorite flask), and we've decided that we're willing to give Ainge the benefit of the doubt, for one reason. Mark Blount is no longer around to assault our basketball sensibilities. For that, we can endure one season of Olowokandi's unprecedented indifference, the thought of Davis, still only 26, growing into his talents as KG's wingman, and Szczerbiak chasing Paul Pierce around the perimeter, clapping his hands and yelling, "Hey, 34, I'm open! HEY! HEY!!!" 35 times a game. Yep, we'll endure. For now, anyway. "Man, that kid is so lazy, he looks like he's slipping into a coma out there. Or is he just playing dead? (Appreciative nod.) Yeah, I can respect that. Looks like a No. 1 overall pick to me." Playing nine innings while waiting for Manny to take the For Sale sign off his Ritz pad . . .
1) So this is how it's all going to play out, huh? 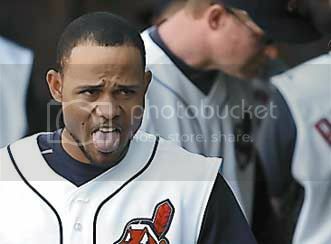 Johnny Damon and Edgar Renteria out, Coco Crisp and Alex Gonzalez in? I suppose an optimist could spin it that the Sox have actually upgraded at center field and shortstop, though I'm reluctant to agree with such bright-eyed positivity at the moment. On the plus side, Crisp had a fairly similar '05 season to Damon and, being six years younger, is seemingly still approaching his peak while the Yankees' newest overpriced ornament is due to decline. And while Gonzalez (who also replaced Renteria in Florida, coincidentally) doesn't have the offensive pedigree of his predecessor, he's a rangy, flashy, and reliable defender - in other words, a guaranteed defensive improvement over Rent-A-Wreck, E6gar, or any other cruel nickname of your choosing. So why our lingering skepticism? Three reasons, really. Let's go to the bullet points! • Crisp is similar to Damon . . . but he isn't quite Damon, and what the Sox gain in youth and payroll flexibility, they lose in experience and the known and invaluable ability to thrive in the Boston pressure cooker. This ain't Cleveland, Coco. • When he has a bat in his hands, Gonzalez is a guy you want on other team. Yeah, he whacked 23 homers in '04, and he already has a World Series notch in his belt against the Yankees. But he's the type of hitter - and we use that term loosely - the recent Sox have avoided at all costs. To put it another way: His .319 on-base percentage in '05 was a career high. (Somewhere, Bill James just had a grand mal seizure.) I can't help but think his signing is an act of slight desperation. • We're a little bummed that hotshot third base prospect Andy Marte - who arrived from Atlanta for Renteria, was named Boston's top prospect by Baseball America, and will depart for Cleveland in exchange for Crisp - is destined to become a footnote in Sox history. Would one at-bat in a Sox uniform have been too much to ask? Again, we realize Crisp is a fine player, but the Indians also realize that the Sox are growing more desperate for a center fielder with each passing day; they'd be fools not to demand a steep ransom. 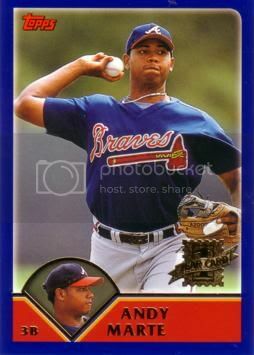 I believe Marte qualifies as such, and when I hear Gammons's story about a Braves scout bursting into tears when discussing the decision to trade him, I worry that his name might someday be linked with Jeff Bagwell's atop the list of the Big Ones Who Got Away. 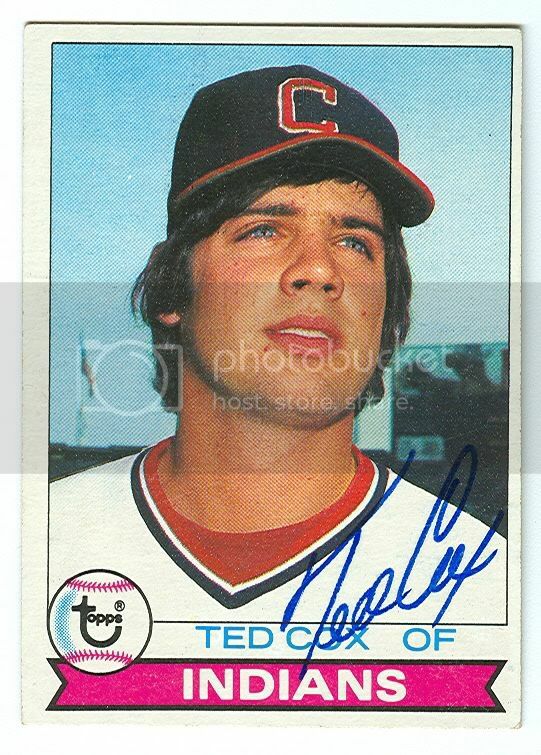 2) I know, I promised a full Theo column after the Sox announced he was coming back. But after three days of battling the bird flu and listening to convoluted talk-radio rhetoric that oh-so-shrilly focused on front-office politics, the so-called disarray of the Red Sox, whether Theo answers to Larry, whether Larry answers to Theo, whether John Henry has a spine or is merely a really pale jellyfish, whether Jed and Ben were hand puppets or marionettes, and whether Theo wears the gorilla suit even in his most private moments, I realized the whole tired episode boils down to a very simple point that everyone somehow seems to be missing: No matter who wields the true clout, the Boston Red Sox are far better off with Theo Epstein working for them then they are without him. It's that simple. I'm thrilled and relieved he's back. And unless you are someone who lost a power struggle to him or are a Yankees fan, you should be, too. 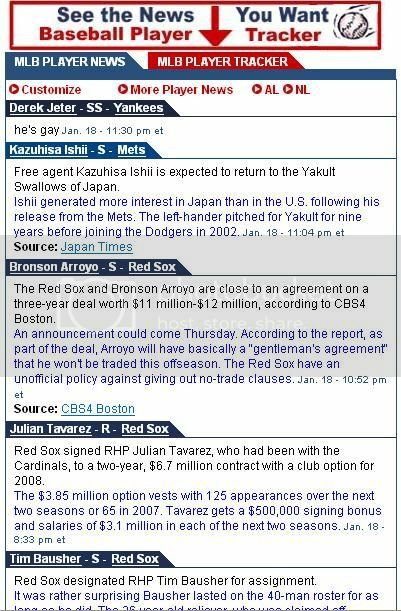 3) I hope the Sox do right by Bronson Arroyo and keep him where he wants to be. He's fearless, rubber armed, selfless, and while he's no ace, he's as productive as more hyped pitchers for half the price. (I was thinking of Matt Clement on that last part.) Besides, in a time when a folk hero like Damon has no qualms about defecting to your greatest rival simply for a few extra digits on a paycheck, it's refreshing to see a player take a discount to stay in a place where he's content. Arroyo's been loyal to the Red Sox. The Red Sox, for at least the next season or two, should be loyal to him as well. 4) One positive and overlooked aspect of the Red Sox's Extreme Roster Makeover: Assuming the Crisp and Gonzalez deals go through, they suddenly are an excellent defensive team. Sure, Manny remains an adventure in left - assuming he remains, period - and Trot Nixon's range in right seems to have decreased in inverse proportion to his waist size. But both are at least adequate in the outfield, and the often sensational Crisp will cover more ground in center than did Damon, who seemed to lose a step last season. Jason Varitek is the rock behind home plate, a statement that needs no further explanation. And the infield . . . well, their gloves are real, and they're spectacular, especially when six-time Gold Glove winner J.T. Snow starts at first base instead of novice Kevin Youkilis. Mike Lowell won the NL Gold Glove at third base last year, Gonzalez could have staked a claim to it at short, and Mark Loretta is better than steady at second base. The Sox may not mash like they have the past few seasons, but their vastly upgraded defense may make their style of play more palatable to the baseball purist. 5) After having seen Roger Clemens struggle to navigate his nine-iron around his increasingly ample gut during that pro-am golf tournament this weekend, I think it's safe to say that he has officially reached the twilight of his career. The Rocket looks like he's been following the John Daly diet plan of bacon with a side order of bacon for five meals a day. 6) Brief NFL interlude: I'm not guaranteeing the Patriots would have beaten Pittsburgh this past Sunday in Foxboro; the Steelers have a certain, familiar "team of destiny" vibe about them, their likeable young quarterback shines brighter with each performance, and for once they might just have enough pure talent and desire to overcome their strategically challenged, mandible-endowed coach. But 10 days after the Patriots' two-year reign met an abrupt end in Denver, it's still hard to comprehend that they so uncharacteristically muffed the chance. Arrogant though it may seem, I guess I kind of forgot the season would go on without them. 7) Brief NBA interlude: Zzzzz. Wake me when Mark Blount's gone, then we'll talk. Because sometimes, it really is random. 3) Hey, think he can play center field? Update, 12:31 a.m.: Um, make that sometime over the weekend. I'm beat tonight and going into hibernation for 10 or so hours. Update, 9:19 a.m., MondayNot that I regret playing with that dead pigeon in the driveway, but I'm pretty sure I have the bird flu. Either that, or I caught the virus my two-year old had last week. Hoping to have a post up tonight. As always, thanks for checking in. 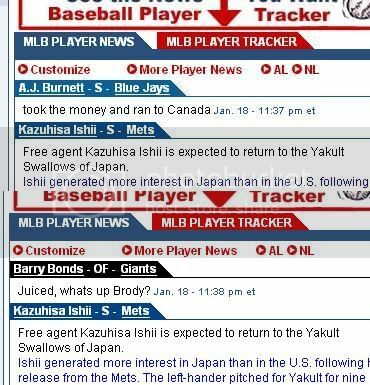 Apparently, some wiseguys hacked into the popular fantasy sports site www.rotoworld.com last night and added their own, er, "spin" to some certain player capsules. In a related story, the FBI has narrowed its suspect list to 2,521,239 Red Sox fans, plus Alex Rodriguez. 1) Peyton Manning morphing into Spergon Wynn in a big game (surprise), blaming his teammates for his team's annual postseason shortcomings (shocker there), and proving once again that he's the A-Rod of the NFL (nope, didn't see that coming). As if we didn't have reason enough already to appreciate Tom Brady . . .
2) Mike Vanderjagt - you might know him as the Liquored Up Idiot Kicker - pulling the shank-a-roo of a lifetime on the potential game-tying 46-yard field goal. He hadn't missed a field goal at home since the Colts were still in Baltimore, or some ridiculous stat like that. So what happens? With the Colts' season on the line, Vandergag steps up, swings his leg, and promptly turns the term "wide right" into an understatement. The word "choke" is thrown around way too often in sports, but what we saw today, sports fans, well, that was a choke. And it was spectacular. As if we didn't have reason enough already to appreciate Adam Vinatieri . . .
3) Those cleverly humorous Burger King commercials where The King is interspersed into classic plays in NFL history. We've seen him pick off Drew Bledsoe and high-step it Prime Time-style into the end zone, dump Gatorade on Don Shula, and reprise the Steve Young role in the QBs famous zig-zagging run against the Vikings. Just great stuff. I can't wait to see what's next - maybe Franco Harris's "Immaculate Reception," or perhaps Adam Vinatieri's game-tying "snow boot" against the Raiders? Or maybe The King can just put on a blue jersey, bounce an incomplete pass, rip off his chin strap and shake his head, thus re-enacting pretty much the entire Manning Family Playoff Retrospective. 4) Watching Panthers QB Jake Delhomme celebrate the victory over Chicago by jumping around like some demented cross between Brett (He's A Warrior-What A Competitor-He'd Play For Free) Favre and the crotch-grabbing, 2003-ALDS version of Derek Lowe. While we appreciate the pure comedy of a Lloyd Christmas lookalike behaving like he'd just won every Super Bowl from I through XL, he might wise to show more grace and humility next time, particularly since we all know Steve Smith makes him. 5) The Colts failing to follow the script and "win" despite the referees' best efforts to give Tagliabue's Darlings the game. To put it another way: Troy Polamalu's interception - and it was undoubtedly an interception - would have stood if he had a horseshoe on his helmet. That's all I've got. I will now return to my regularly scheduled Sam Adams Winter Lager . . .
1) I guess there's really no gentler way to put it: The champs gave their crown away. When you cough up five turnovers, four of which lead directly to 24 points, you are simply not going to win a football game, no matter how smart your coach, how poised your quarterback, or how many rings you have tucked away in the safety deposit box from your previous conquests. The two-time defending champion Patriots played their most mistake-prone game in recent memory, and the resourceful Denver Broncos were good enough to take advantage of their opponent's generosity with the football. And that's that. Over and out. Yup, it's really that simple. 2) So there we all were, poised and cocky and waiting for Jake Plummer to make that fatal mistake, and what happens? Tom Brady - he of the three puny interceptions in his 10 previous playoff games - chucks a spirit-crushing, game-changing, positively Plummer-esque interception on the goal line that Champ Bailey returns all the way to the Patriots' 1-yard line. A potential 13-10 lead - or a 10-9 deficit at worst - is now suddenly a 17-6 ditch, and we were so stunned as we watched Bailey make a beeline down the left sideline that it almost didn't seem real, like all of a sudden we were watching our buddies play a game of Madden or someone had just slipped in a DVD of "Bledsoe's Biggest Big-Game Blunders." I imagine we all shared the same thought: C'mon, these things don't happen to the Patriots. Tom Brady doesn't make those mistakes. Yet tonight, they did, and he did, and who the hell saw that coming? In the aftermath of the game-changing blunder and ultimate defeat, Patriots trudge toward the long offseason feeling a dull sadness and having learned a cruel truth: In the biggest moments, Tom Brady isn't infallible after all. 3) Thinking happy thoughts here . . . happy thoughts. Well, let's see, Asante Samuel played his best game of the season by far. And yes, I say this while fully cognizant of his costly pass interference penalty. Seems to me he played the ball in precisely the manner a cornerback is taught, and the referee, perhaps mistakenly thinking the Colts were playing and remembering that their receivers aren't allowed to be touched under any circumstances, got a little too flag-happy. To put it another way: There's nothing Samuel should have done differently, on that particular play or in his overall performance tonight. His Law-like effort gives me hope that he, Ellis Hobbs, and perhaps even the brittle Randall Gay, can hold down those hard-to-fill cornerback slots for the next five or so years. 4) Now that we know Ben Watson has the determination to match his freakish physical ability, I'm giddy just thinking about the unstoppable force he is poised to become. His 100-yard, across-the-field, outta-my-way-ref sprint to chase down Bailey deserves to be more than a footnote in this game. It was one of the great hustle plays I've ever seen, even if it didn't bring its just reward. 5) With its stellar performance tonight, Eric Mangini's defense proved that its late-season resurgence was legitimate, and not a mirage created by facing inferior competition. The rookie defensive coordinator deserves praise for the job he did in replacing Romeo Crennel during an often tumultuous season. And while I'll be pissed if it's later revealed that he pulled a Parcells and ran up a monster phone bill to Hempstead, N.Y., this week, it's apparent that the Jets have the right idea in pursuing this guy to be their next head coach. Mangini's got the goods. 6) Watching the selfless, affable Christian Fauria hugging everyone he could get his arms around on the sideline as the clock wound down, you couldn't help but believe he was saying goodbye for the final time as a teammate. And he won't be the only one. Bethel Johnson seems hell-bent on wasting his ability, and his ticket out of town is probably already punched. Steve Neal, a masher of a run blocker, is an unrestricted free agent. Doug Flutie might grab his baseball glove and take up permanent residence in the Monster seats, calling an end to his truly unique career. And I'm pretty sure we've seen the last of Duane (Toast) Starks as well. As for one they must keep: David Givens. While the fourth-year receiver battled the dropsies late in the season, he's tough and steady, the embodiment of the Patriot Ideal in many ways, and his name should be atop Scott Pioli's To-Do list if the sticker price is reasonable. 7) . . . And even if it's revealed that Corey Dillon never quite recovered from his early season foot injury, it's apparent that his days as a feature back are drawing to a close. The burst and ferocity that helped him set the franchise single-season rushing mark last season was absent for just about all but a few flashbacks this season. It may not be time for the Patriots to replace him, but it is time to find his successor. 8) Please, please, please, I beg of you, don't let the Chicken Littles, 'EEI banshees and various other miserable, basement-dwelling mouthbreathers convince you otherwise: The Patriots, with much of their core still in its prime and this season of countless obstacles behind them, will be back. This is not the end of an era, the downfall of a dynasty, or any other such overwrought obituary. Belichick isn't going anywhere. Neither is Brady. The core remains. Again: They will be back. And four out of six sounds plenty reasonable to me. 9) And so we put away the football until the leaves begin to fall, and go reluctantly into that annual dead-zone of the sports calendar, when we pretend to give a flying damn about the Celtics and Bruins. (Oh, right - Turin. Yawnnnn.) Thank goodness that we have these magic words to get us through the rest of winter: Pitchers and catchers report in a month. Center fielders and shortstops . . . well, that's still to be determined. Because cranked out a quickie post before the Pats' romp over Jacksonville, I'm bound by the Sports Nut's Laws of Superstition to do so again today. Anyway, my head tells me the Pats win fairly easily tonight, though the butterflies in my stomach beg to differ. I think Tom (10-0) Brady exposes the youthful Broncos secondary, Ben Watson and/or Kevin Faulk take a spin in the spotlight, and Richard Seymour and the rejuvenated defense contain Tatum Bell and Mike Anderson enough to force Jake Plummer to revert to his erratic Arizona ways. 1) TATB is an admirer of Jake Plummer dating back to those Big Man On Campus days when he and the late, great Pat Tillman led an undermanned Arizona State team to the Rose Bowl, but even his most ardent believers have to expect that he'll hit a couple of Patriots defensive backs in the numbers today. 3) Continue to hold him accountable for past sins if you must, but Paul Pierce deserves better than this. 4) Julian Tavarez . . . Rudy Seanez . 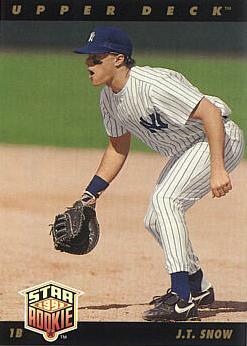 . . Mike Timlin . . . Guillermo Mota . 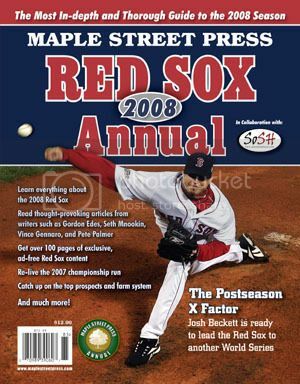 . . hmmm, seems to me that the Sox' accumulation of proven, interchangeable setup men suggests that if Keith Foulke self-destructs again, a sequel to the 2003 flop "Closer By Committee" may be coming soon to a certain ballpark near you. 5) If you knew Cedric Cobbs was on the Broncos' practice squad, well, I'm guessing you had a better fantasy football season than I did. 6) I've written it before and I'll write it again: In my 27 seasons as a fan, I cannot recall a Boston athlete more admirable in the way he goes about his business than Troy Brown. 7) Can't you just picture the NFL's most insufferable preener of a ref flexing, kissing his biceps and saying, "Two tickets to the gun show, anyone?" 8) Considering Bill Belichick's predilection for rule-bending attempts at gamesmanship, am I wrong to worry that Tedy Bruschi's absence from the injury report also means he'll be absent from the lineup? 9) Now, I'm not saying the Red Sox' newest reliever is homely, but rumor has it Freddy Krueger once wore a Julian Tavarez mask for Halloween. 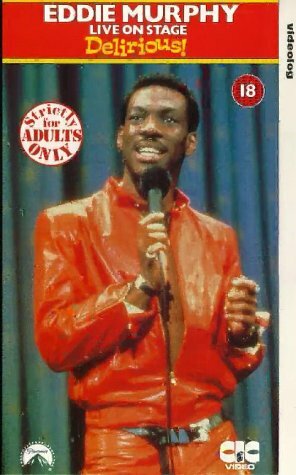 Tom Jackson, "NFL PrimeTime," approximately 11:49 tonight: "All right, ---- it. The Patriots LOVE their coach, okay? LOVE him. He's great, a genius, the best there ever was, the best there ever will be. All right? Is that enough for all of you ------ Pats fans? Huh? I was wrong. I admit it. I don't know what the ---- I'm talking about, ever. Just throwin' ----- against the wall. Now leave me the ---- alone, all right? Wha . . . NO, I'M NOT, OKAY, BERMAN!!! DO NOT TOUCH ME, BOOMER!!! DON'T TOUCH ME, I SAID!!! BACK-BACK-BACK-BACK OFF!!! I'VE HAD ABOUT ENOUGH OF YOU, TOO, YOU STUMBLIN' BUMBLIN' -------------." 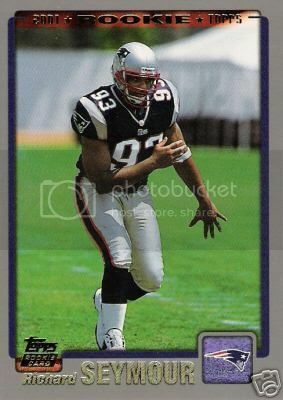 • Richard Seymour didn't play in the season's previous meeting, a 28-20 Denver victory, and you, me, and all-time playoff sacks leader Willie McGinest know how much of an impact Seymour's presence has on the rest of the defense. He commands the attention of the offense - he simply cannot be blocked one-on-one - which eases the burden on those around him. It is not a coincidence that McGinest and Rosey Colvin have raised hell like LT and Carl Banks since Seymour's return from a knee injury. • Rookie Ellis Hobbs has emerged as a top-flight cornerback. Frankly, even if he were merely a Poteat-caliber corner, he'd be an upgrade on the departed Duane Starks, the charbroiled goat of the early season loss. Not to get all analytical and Jaworski on you, but man, that guy sucked. • Tedy Bruschi is back, and barring setback to his injured calf during practice this week, is as damn near as good as ever. I trust that no further explanation of that man's importance is necessary. 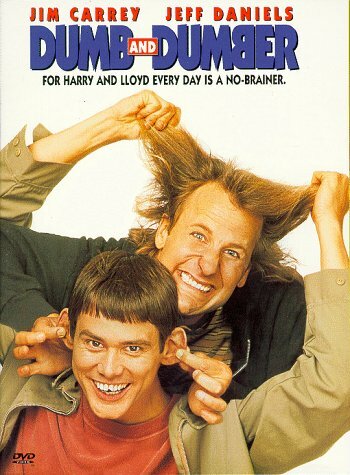 • Despite receiving repeated shocks from Mike Shanahan's handy tranquilizer gun every time he throws an interception, Jake Plummer is still Jake Plummer, a gambler at heart, and we're betting he's incapable of countering a Bill Belichick scheme twice in the same season without coughing up a couple crucial turnovers. Have we mentioned that the Patriots' defense is healthy this time around? "So I'm leaving Gillette Stadium early Sunday morning, thinking, God, Tom Brady was pretty blah tonight. I get back to my hotel, open up the stat sheet and see: 15-of-27, 201 yards, three touchdowns, no picks, 116.4 rating. Then I think: That's when you know a guy's going to Canton -- he plays blah (for him) and his numbers are Player of the Week worthy." Brady, as I'm sure you know, is 10-0 in the playoffs. That first blemish in the loss column has to come sometime, I suppose. It just won't be this week. 2) Apparently, the people of Denver are spending less time focusing on this game and more time feeding their collective facial hair fetish. Not that the fate of Jake Plummer's John Holmes Tribute 'Stache isn't a worthy cause, of course. 3) Despite my belief that Troy Polamalu is the most overrated defender in the NFL - his awesome mane and knack for the occasional knockout blow distract all those experts who voted him All-Pro from noticing that he's just about Starks-esque in coverage - I am convinced that the Steelers will be coming to New England for a rematch of last season's AFC Championship Game next weekend. The Steelers will grind it out with the rejuvenated Bus on offense and keep Peyton and Co. off the field, and defensively, they'll inflict enough pain on Marvin Harrison and the rest of the lightweight, contact-averse receivers that they'll again shrink when the season hangs in the balance. The pick: Pittsburgh, 21-17. Oh, yeah - the Pats win, too, 28-17. 4) Words we never thought we'd write: Monty Beisel has become a useful part of the Patriots' defense. While we slashed Beisel along with everyone else during his - and there's no kinder way of saying this - brutal stint as Tedy Bruschi's stand-in, we always understood why Scott Pioli and Belichick liked him enough sign him away from the Chiefs in the offseason. Beisel has tremendous speed and a motor that never stalls. Unfortunately, that speed and desire often led to him overrunning a play, leaving the defense susceptible to cutback runners such as Tatum Bell, and that's in the off chance he was in the right position to begin with. But to his credit, he's continued to work hard, learn and gain comfort in the Patriots system, and against Jacksonville Saturday night, he made a couple of point-of-attack plays that even Bruschi would be proud of. I'm not saying I won't be queasy if he's on the field in place of Bruschi Saturday night. But I'm not saying he wouldn't come through, either. 5) And while I'm confessing my past sportswriting sins regarding current Patriots, I might as well admit that I wrote a column sometime in the 2002 season demanding that Belichick release Kevin Faulk. Yeah, that Kevin Faulk . . . the one who has become a steady, invaluable and underrated stalwart in the Patriots' passing game, a player whom every team in the NFL would be pleased to have. (Conveniently, I was unable to find any trace of the ridiculous article on Google.) If I recall, the venom toward Faulk flowed through my keyboard after he dropped a lateraled screen pass against Green Bay, then failed to pick up the ball as the Packers took it in for a touchdown on the way to an easy win. At the time, the play epitomized what was wrong with the Pats - indifference, namely - and it was not the first instance of the then-fumble-prone Faulk making a boneheaded play at the most inopportune time. Needless to say, it would have been foolish to dump such a versatile and intelligent player, one who, in retrospect, just needed time to grow. Faulk has matured and improved at his job since then. Come to think of it, I hope I have too. 6) It's going to be fascinating to see how the Jets' pursuit of defensive coordinator Eric Mangini plays out. Mangini, 34 and with one season as a coordinator on his resume, seems like an obvious head coaching candidate . . . in 2008. From what I've seen and how Bill Belichick interacts with him, I'm hard-pressed to believe he's ready to take over an NFL team on his own, even if that NFL was team previously run by the comically inept Herman Edwards. I suspect the Jets' interest has as much to do with his link to the lamented former HC-of-the-NYJ-For-A-Day and the perceived damage it might do to the Patriots as it does with any strong belief in his particular coaching talents. Yet if Mangini turns down the Jets - and by all accounts he is their first choice - does that mean Belichick has promised that he'd someday be his successor here in New England? More to the point, just when might that "someday" be? Because when it comes to the length of Belichick's tenure here in New England, anything less than forever would be a disappointment. 7) Let's see. Andre' Davis is a speeding bullet as a gunner on the special teams, averages over 20 yards a catch as the Pats' designated deep threat, made perhaps the play of the Jags game with his heads-up recovery of Ben Watson's fumble, and has the beep-beep! speed to pull a Rick Upchurch every time he returns a kick. Yup, I'd say Bethel Johnson's days as a Patriot are just about numbered. 9) Remember before you mock him, people: Chuck Norris invented the Internet, and with one roundhouse kick, he and his almighty beard can take it away. Everyone always makes such a big deal about Jerry West being the model for the NBA logo. 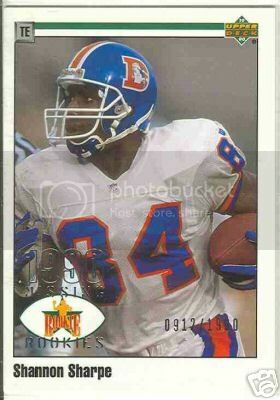 Ask me, the Broncos' decision to pay homage to Shannon Sharpe by putting his face on their helmet is a far greater tribute. 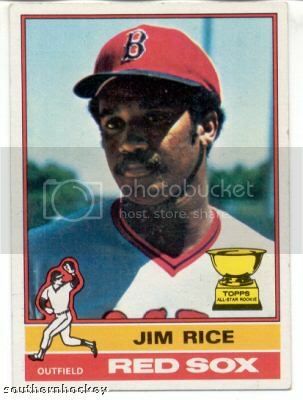 News flash: Jim Rice, baseball's most dangerous and accomplished slugger for more than a decade, gets a measly 65 percent of the vote and fails to make the Hall of Fame in his 12th year of eligibility. We don't have the time this afternoon to give Rice's annual shafting the appropriate consideration, so we'll do the next-best thing. We'll again paraphrase that noted wordsmith and legendary connoisseur of bacon, egg and cheese sandwiches, one Maurice Vaughn: "Stupid Hall of Fame voters! . . . They stupid!" Man, sometimes we sports writers don't exactly cover ourselves in glory . . . but you probably knew that, huh? At the risk of "disrespecting" the three-time champs, I spent a good amount of time this week fretting about this matchup. The Jaguars, a stealth 12-4 during the regular season, are constructed to win this time of year. They feature a sturdy front seven on defense, an offense that lacks flash but makes the most of its opportunities, and a fiery coach gets his team to play with ferocity and, with the exception of an occasional Marcus Stroud meltdown, intelligence. No, they are not as deep or talented as the Patriots, and given their lack of big-game experience, it would be a stunner if they were as poised or prepared. But given a fortunate bounce or two from the Football Gods, I feared the Jags were equipped to put a scare into them, and perhaps even thwart this presumed journey to a threepeat before it barely began. Notice I said feared. Past tense. When the season is at stake, take Brady, Belichick, Vinatieri and the rest of this proven championship crew over Leftwich/Garrard, Del Rio, some lonesome kicker, and Fred Taylor's surgically reconstructed pulled hangnail every single damn time. 1) He put on a one-man show for the ages Wednesday night, but to these semi-trained eyes, Vince Young is Daunte (Boat Drinks) Culpepper with slightly better footwork and a considerably weaker arm. 2) And Matt Leinart is the lefty version of Chad Pennington, as Jets fans will likely find out firsthand. 3) Hey, now that's the Pete Carroll I came to know and loathe during his time in New England - blinking obliviously, exuding panic, completely overwhelmed by the moment as his talented but undisciplined team lets victory slip from its grasp. 4) And just wait 'til they ban B-12: The vocal Get Manny Gone brigade won't tell you this, but production-wise, Miguel Tejada, suspiciously enough, is coming off his worst season since 1999. 5) J.T. Snow, still Keith Hernandez-like with the glove at age 37, will be a useful complement to Kevin Youkilis at first base - think of him as Doug Mientkiewicz with fewer vowels and no starter collection of World Series memorabilia. 6) I can't imagine Bill Belichick has anything more compelling in his vast collection of football books than the masterpiece David Halberstam wrote about him. 7) He's an engaging guy and was a hell of a clever player back in the day, so we feel obligated to put this as nicely as possible: Until the brutally incompetent Isiah Thomas makes his inevitable return to an NBA bench, Doc Rivers has to be considered the most "strategically challenged" coach in the NBA. 8) Underestimate the Jaguars at your own risk - their skull-cracking defense and grind-it-out offense is strikingly reminiscent of the Titans team that gave the Patriots all they could handle in the divisional round two years ago. 9) Will someone please tell us once and for all if/when Theo's coming back? Well, someone has to start at shortstop Opening Day. • In the immediate days after the stroke, Bruschi was certain his career was over. "I thought I was done. I'm done. I can't see, I can't walk. I'm finished," he said. Yet doctors never told him a return to football was out of the realm of possibility, either because it seemed so apparent it wasn't worth stating, or because "they were scared of telling me," Bruschi said with a laugh. • The footage of Bruschi leaving the hospital is chilling. We may have subconsciously denied it back in January, but watching him lean on his wife Heidi as he walks gingerly from the hospital to a waiting van, pained determination on his face as he tries to mask his true condition, you'd have hard time convincing yourself he'd ever set foot on a football field again as a participant. "I look at this third one. I hear the crowd. I smell the grass. I feel the pain of every victory. (Phew.) Everything is encapsulated in this ring when I look at it." • NFL Films does its usual stellar job of capturing the palpable emotion in the stadium during Bruschi's return against the Bills. It also takes us behind the scenes to the postgame Patriots' locker room, and catches that old softie Bill Belichick calling the team together and saying, "How great is it to have Tedy Bruschi back?" (The players answer with their trademark "Oh, yeahhhhhh!") There is also a sweetly personal moment between Bruschi and Tom Brady; the dialogue is barely audible, but the warm and genuine sentiment as Brady talks is obvious: Welcome back, old friend. • After the loss to the Colts later in the season, Tony Dungy, ever so classy, goes out of his way to seek out Bruschi: "It's good to see you . . . it's good to see you out here," Dungy says. "Welcome back." Given the unthinkable recent tragedy in Dungy's life, the vignette resonates even more powerfully now. • In the last minute or two of the program, this ironic bit of info scrolled across the ESPN Bottom Line ticker: Patriots LB Tedy Bruschi (calf) questionable for Saturday's game vs. Jacksonville. Funny, but something tells me a trivial little calf injury isn't going to keep Bruschi away. 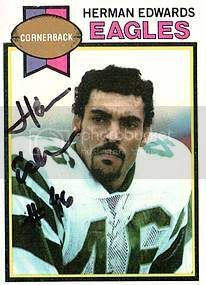 2) After watching Randy Moss slog and dog his way through the Raiders/Giants game Saturday night, I can make this proclamation without a sliver of a second thought: If the object is to win football games rather than sell jerseys, I'll take David Givens over Moss 100 times out of 100. Deion Branch already goes without saying. 3) I was surprised to hear Tom Brady talking like a graduate of the Rodney Harrison School Of Imaginary Disrespect this morning during his weekly appearance on WEEI. Brady, who missteps verbally as rarely as he screws up on the football field, claimed that most people had given up on the Patriots, including "media, and our fans." It's a preposterous suggestion - the fans' mantra all season has been "just wait til we get healthy" and prominent national media folks such as Peter King have been praising the Patriots so much, you'd think the franchise has changed its name to the New England Favres. Brady should be above parroting such nonsense, though I suspect his opinion was shaped by listening to the ill-informed mouthbreathers on the very station he was appearing on. One of the most compelling figures in the Jets' season was cornerback Ty Law, the ballyhooed free-agent signing who intercepted a career-high 10 passes and made the Pro Bowl. But his sterling performance on the field was only one side of the story. Turns out that Law was a major headache for the coaches. Apparently, he operated under the Ty Law Rules. 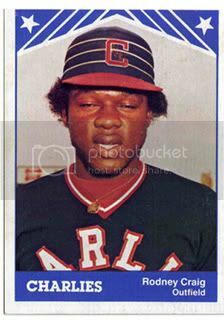 According to multiple sources, Law rarely practiced on Wednesdays, played overweight, argued with the strength-and-conditioning staff and hurt team chemistry with his attitude. His seat in the defensive meeting room was changed because the coaches didn't want him sitting next to promising rookie cornerback Justin Miller, said one source, claiming Law was a poor influence. Ask me, there's something fishy here. Sure, Law has flaws. He has always owned a swollen opinion of his own abilities, he's never tried to hide the fact that money takes priority over loyalty, and he never should have given his cousin access to that duffel bag. But a bad influence? Based on watching him for the better part of 10 seasons in New England, I'd say he's exactly the kind of guy you want your younger players to emulate. He's fearless, smart, prepared, tough, believes in himself, plays his best in the biggest moments, and even when there is turmoil around him, he rises to the occasion. (I also remember him suggesting that Chris Canty couldn't play during training camp of Canty's rookie season, which immediately made him a better talent judge than Bobby Grier.) He was one of few veterans who didn't quit on Pete Carroll, and judging by his performance with the crashed-and-burned Jets this season, he didn't quit on Herm Edwards, either. I suspect someone in the Jets front office, fearing backlash when they don't pick up Law's option, planted this story in order to justify the impending decision. If you've got a better explanation, I'd like to hear it, because this just doesn't sound like Ty Law to me. I can't argue with the fans' selection of Willie McGinest for the 12th player award. McGinest, a favorite of ours ever since he turned Tony Boselli into Max Lane during the '96 AFC title game, can clear space in his trophy case next to the plaque TATB gave him upon interviewing him in training camp many years ago: Largest Non-Fat Human We Have Ever Encountered. (Okay, we didn't really give him a plaque. But we might have, if we weren't too busy going all fetal and quivering in fear.) 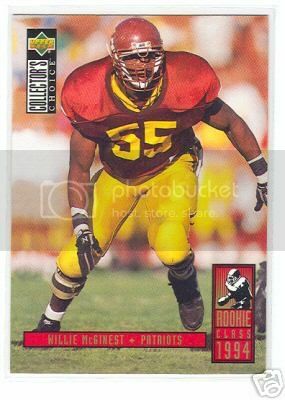 Our admission of admiration is not meant to suggest we would have cast our vote for McGinest, however. We would have dangled the ol' chad, so to speak, for Nick Kaczur, the rookie tackle who filled in so ably when Matt Light went down and managed to keep Tom Brady from being folded, spindled and mutilated from the blindside. Come to think of it, we also might have thrown our support to that other guy - you know, What's-His-Name, the linebacker - the dude who came back in the middle of the season from a freakin' stroke. Then again, the 12th player is about 11 spots lower than Tedy Bruschi's current ranking in the hearts of Patriots' fans. 1) Unless he spent significant time with a speed coach in the past week, it's fair to say that the Patriots can expect Corey Dillon to give them just about what Antowain Smith gave them during their first two Super Bowl victories: determination, a short-yardage plow, and very little chance of being the positive determining factor in the game. The Patriots will need last year's version of Dillon to control the ball against Air Peyton and beat the Colts (assuming, with the arrogance of a three-time champ, that they will make quick work of the Jaguars). I'm not saying he can't be that guy, because Dillon isn't the kind of dude you bet against. But I haven't seen a lot of signs this season that he's capable of it, either. 2) Whenever I'd get frustrated with my job back when I actually covered a game on occasion, I'd remind myself that I got to experience certain things that a lot of fans would kill for. (Trust me when I say seeing Rich Garces eating a plate of food buck-frighteningly-naked was not one of them.) 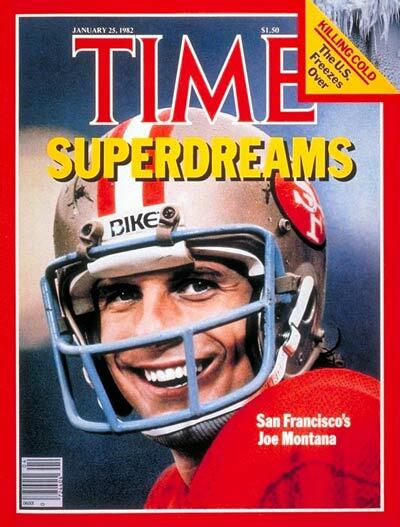 I was again reminded of the cool perks of being a sports writer earlier this week when Bill Belichick invited the media into a meeting room to watch him break down film of, among others, Joe Montana. I mean, for a New Englander who follows sports with a passion, does it get any cooler than getting a front-row seat while one of the greatest football minds of all-time casually imparts his wisdom on defending the greatest quarterback of all-time? And in broader terms of sports and pop culture, is there anything that would equal it? Watching the Final Four with John Wooden, perhaps? Talking flax seeds and hypodermics with Barry Bonds? Watching "90210" re-runs with Bill Simmons? It must have been fascinating listening to Belichick discuss Montana's strengths and weaknesses (or weakness, which Belichick noted singularly as ball security). Considering Montana's uncanny similarities to the current Patriots quarterback, those in attendance had to be left with one compelling question: How would Bill Belichick defend Tom Brady? Damn, I wish I was in that room. 3) His statistics were much better than his aesthetitics, but I'll say this after watching strong-armed, happy-footed, occasionally accurate Matt Cassel's first real taste of NFL action: He has a better future than at least two current starting quarterbacks in his own division (Gus Frerotte, Brooks Bollinger) and he's probably already superior to a third (J.P. Losman, a blatant bust of a first-round pick). Not bad for a seventh-round pick whose college experience consisted of holding a clipboard for Carson Palmer and Matt Leinart. As far as how he might someday stack up to the other starting QB in the AFC East, let's just state the obvious: Here's hoping he never takes a meaningful snap for the New England Patriots. 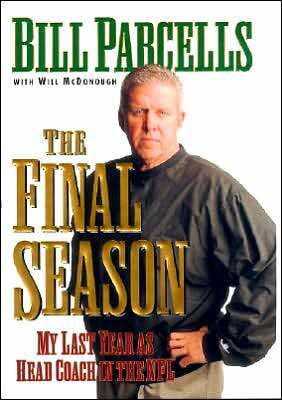 4) As if three Super Bowl victories and the confidence that a fourth is possible even during a tumultuous season aren't enough reasons to thank the football gods for delivering Bill Belichick to the Patriots, remember this: If Belichick had done what the Big Tuna demanded and remained as HC of the NYJ, Bob Kraft's Plan B was a management team of coach Dom Capers and general manager Tom Donahoe. Capers, a thoroughly uninspiring sort, lost his job as head coach of the Houston Texans yesterday, and Donahoe, whose high point in Buffalo came in the Milloy's Temporary Revenge game in the first week of the 2003 season, might be wise to post his resume on Monster.com as well. Something tells me that if those two had ended up in New England, those three Lombardis would be glittering in some other franchise's trophy case. 5) Ty Law picked off three passes yesterday, giving him a career-high 10 for the season. So much for my hopes that he'll be back to his rightful place with the Pats next season, playing on short money and perhaps making the Rod Woodson-style transition to safety that will enhance his borderline Hall of Fame chances. Law looks heavy - rumor is he ate Ray Mickens when Mickens wouldn't give him No. 24, though the Jets claim Mickens was merely cut - and his wheels are wobbly. But his interception/TD against the Pats showed he's still as smart as ever, and 10 picks is 10 picks, so somebody is going to pay him more money than he's probably worth at this stage. 6) So if Bill Parcells does screw over the Cowboys in the same predictable manner he did the Patriots and Jets, will he title his latest memoir "The Final Final Season: And I Mean It This Time . . . All Right, Fellas? . . . Okay . . . All Right"? Or will it have a more appropriate title. Something like . . . oh, I don't know, this: "Throwing Up In My Mouth: Why I Never Won A Damn Thing Without Belichick" Either way, I'm not buyin'. Fool me once . . .
7) Is there anyone out there who doesn't think the Steelers are going to dismantle the Bengals? Cincy's got some growing up to do before its ready to play with the big boys in the AFC. We here at TATB happen to think that Alexander will win the award, and it's hard to argue against anyone who rushes for 28 touchdowns and leads his team to the top seed in its conference. But by our accounting, Alexander is the most outstanding player, while Brady is the most valuable, and if you doubt there is a difference, look at it this way: With some slappy running back replacing Alexander, Seattle probably still wins 10 or 11 games. With Doug Flutie, Matt Cassel, Rohan Davey, Kliff Kingsbury, Tom Ramsey, Tom Owen, Matt Cavanaugh, Scott Secules, Jeff Carlson, Scott Zolak, Drew Bledsoe and/or just about any other quarterback outside of the Manning family replacing Brady, the Pats likely begin their season with a 1-7 record, and all this talk about winning a fourth Super Bowl is long ago replaced by which linebacker or defensive back they should take in the draft. "Don't know if you heard this, but Burton was talking on WEEI this morning about playing against Tony Eason in college. He said he played QB at Northwestern when Eason was Illinois and Eason was even thought of as a sissy then. Good scouting by the Pats. But that's not my point. After hearing Burton, now I think I understand why he comes across as, to put it nicely, not so sharp on TV. Those Northwestern teams were BRUTAL. He must have taken some serious blows to the head." Interesting theory, Eric. If we get the chance to pose the question to Burton should we ever cross paths, we'll be sure to phrase it in terms he'll understand: "Concussions . . . how many?" 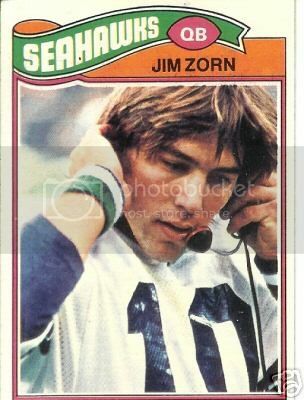 He finally took the Flow-Be to the famed mullet, and maybe there are few more crow's feet around his eyes, but considering this football card is 17 years old, you'd have to say the little bugger is aging gracefully. Yes, if yesterday's drop-kick extra point was the final play of Doug Flutie's truly unique, proving-the-doubters-wrong, doin'-it-my-way, Grey-Cup-winnin', kickin'-it-old-school, 21-year pro career, I can't think of a more appropriate final bow. Other than perhaps a game-winning Hail Mary against Miami, of course.